T+L Culinary Journeys: Best known for bringing Mexican cuisine to Copenhagen, American-born chef Rosio Sanchez takes a break from the kitchen to explore Scandinavia’s newest dining destination, Stedsans in the Woods. From left: Rosio Sanchez gathers eggs from the chicken coop at Stedsans; a dish of weeds, edible flowers, poached eggs, and hazelnuts. Deep in the forest of southern Sweden, I was struggling to keep up with chef Rosio Sanchez. As pine branches lashed my face and legs, she scampered ahead through the dense underbrush. Was this a return to childhood? “I’m from Chicago,” Sanchez said, laughing. “There was no camping.” But there was a five-year stint at Noma. As René Redzepi’s former pastry chef, Sanchez clearly learned a thing or two about navigating the Nordic landscape from her mentor, the world’s preeminent foraging evangelist. Rolling up the sleeves of her white T-shirt to reveal a biceps inked with roses, she reached for a nearby branch, plucked off a fir shoot, and popped it in her mouth as casually as if it were a tortilla chip. Sanchez and I were at Stedsans in the Woods, a back-to-nature retreat, restaurant, and permaculture farm founded by a Danish couple named Mette Helbæk and Flemming Hansen. Stedsans sits on 17 wooded acres on the shore of the bucolic Lake Halla, a two-and-a-half-hour drive north of Copenhagen, where Sanchez lives and works. I was accompanying Sanchez on a culinary pilgrimage of sorts — a chance for her to escape the relentless pace of running restaurants and investigate the latest iteration of the wild, destination-centric Nordic dining culture pioneered by culinary icons like Sweden’s Fäviken and Koks, in the Faeroe Islands. Chef Rosio Sanchez visiting Stedsans in the Woods, a new foraging restaurant and retreat in the Swedish countryside. We arrived on a warm day in June and checked in to newly built wooden cabins that were rustic (compost toilets, no electricity) yet comfortable, with soft, organic bedding and floor-to-ceiling windows framing the unspoiled forest. The trip was a rare break for the chef, who was missing only her third day of service since opening her first proper restaurant, Sanchez, in Copenhagen in December. Instead, Sanchez became a distillation of the chef herself, a modern, unpretentious restaurant with Mexican roots and high culinary ambitions. Already it’s a game-changing addition to Copenhagen’s restaurant scene. You’ll find gooseberries in the pozole and fjord shrimp in the tacos, but Sanchez won’t compromise on the tortillas, which means importing Oaxacan corn for the masa. In the woods, however, there were no tortillas. The restaurant at Stedsans is resolutely Nordic, serving hearty, elemental feasts rooted in the seasons. The open air kitchen is powered solely by fire, so we found ourselves sipping aperitifs of Crémant beside makeshift grills strung from the trees before joining the other guests — a total of 12 that evening — for a family-style dinner. 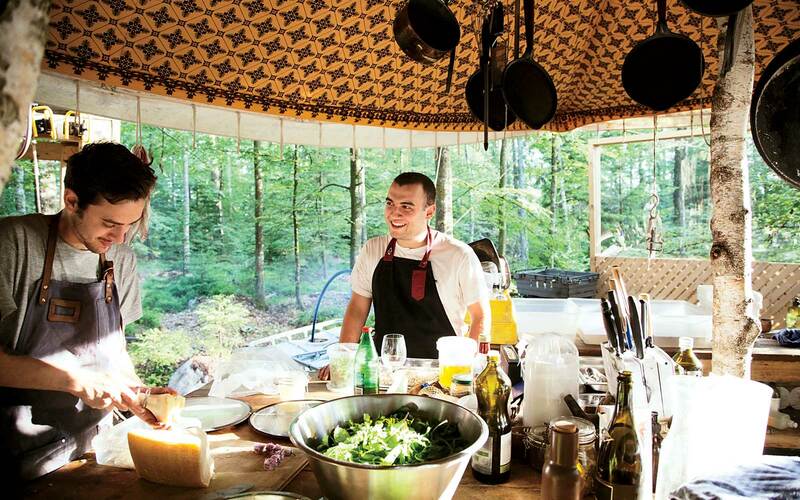 Chefs prepare dinner in the kitchen of Stedsans in the Woods. Aside from a platter of grilled pork, the meal focused on hyper-local produce, most of it grown on the farm or picked in the forest: late-spring asparagus, green onions, smashed potatoes, foraged herbs, and the magenta rose-hip blossoms we had seen on our afternoon walk. It’s light, unfussy cooking, which suits Sanchez perfectly. “I’ve been a pastry chef most of my life, so I don’t work with a lot of meat,” she said. But she does eat and drink like a chef — in other words, with gusto. After a long, lively dinner, we walked down to the lake. It was that magical time of year when the night sky descends into twilight, but never darkness. We hopped aboard the retreat’s floating sauna, an unmoored wooden A-frame drifting freely on the water. 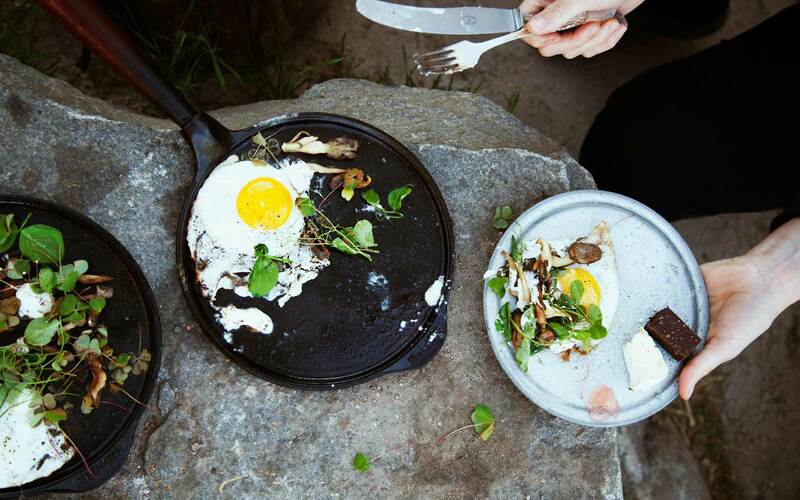 An alfresco breakfast of eggs, mushrooms, and foraged greens at Stedsans in the Woods. Inside, Sanchez focused her intense gaze on the glowing stove. “I don’t think it’s hot enough, do you?” she asked. Before I could protest, she dumped another ladle over the embers and a cloud of steam filled the tiny sauna. Coasting across the surface of the glassy lake, the buzz of the city many miles away, she finally exhaled. How to Go: The best way to reach the retreat is by car. Göteborg, Sweden, is an hour and 45 minutes’ drive; Malmö, Sweden, is two hours; and Copenhagen is two-and-a-half hours. Cabins and tents are $763 for two people, with breakfast and dinner; stedsans.org.